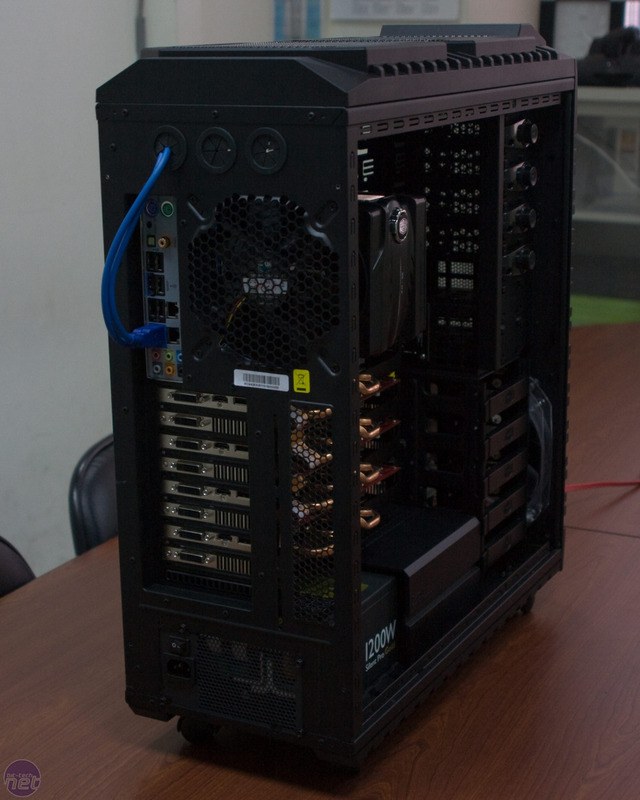 If you're already well versed in Cooler Master products, you'll realise that "942" is above its existing and very popular HAF 932 case, so as you probably guessed too then, it's also bigger. 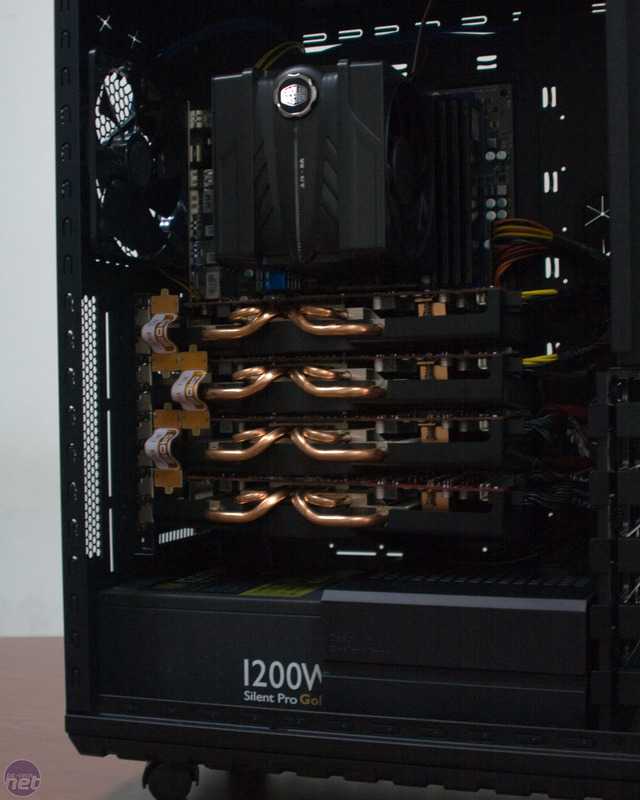 It's quite a bit bigger in fact: the HAF X has two 200mm fans in the roof, with mounting space for a triple 120mm radiator beneath these large fans. 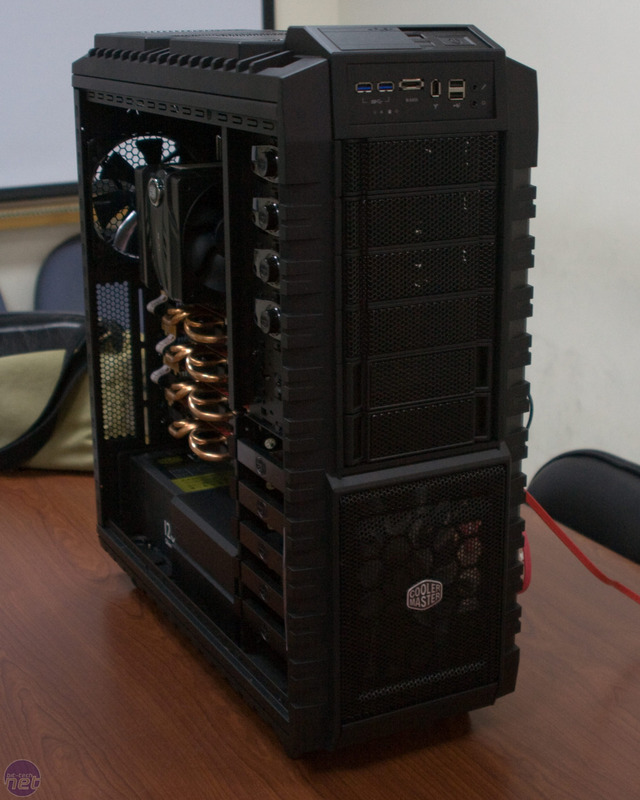 There's also one 140mm fan in the rear and another 200mm in the side panel over the graphics cards. 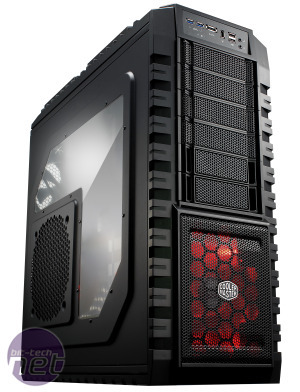 There's even enough space spare for a large L shaped case window around that side panel fan! 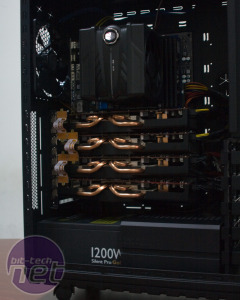 Here's Cooler Master's official shots - see below for ours! 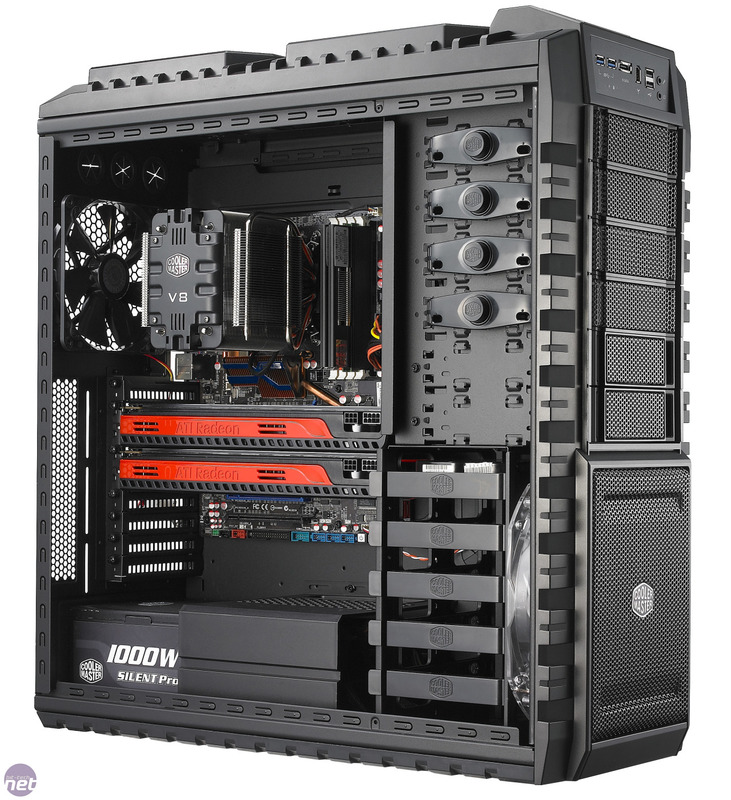 The capacious interior yields enough space for plus-size ATX motherboards, and nine PCI Express brackets offer more than enough room for quad-Crossfire Radeon graphics cards or 3-way Nvidia SLI with PhysX on your super-sized Gigabyte UD9 motherboard (if you can afford it). Still, folders: take note. 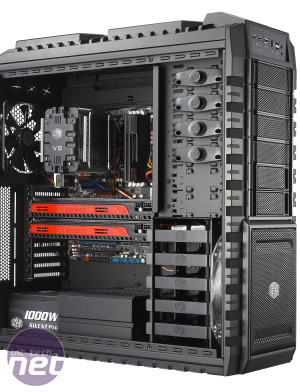 It won't take an EVGA SR-2 though - Cooler Master is making another new case for wide-boy boards. Given that a 200mm fan with LEDs is used in the front as well, we'd estimate it's as wide as the previous HAF series, but even so it still comes kitted with wheels because a) it's all steel and b) once filled it'll be a seriously heavyweight machine. 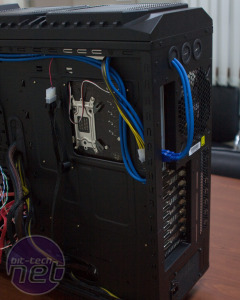 You can see there's 'only' six bays for hard drives, which you can see in the side-on photos, but hidden above are a pair of not hot-swap but front accessible 'S-bays' to mount hard drives. These connect to a little PCB internally that has a molex plug for power and a couple of SATA connectors too. 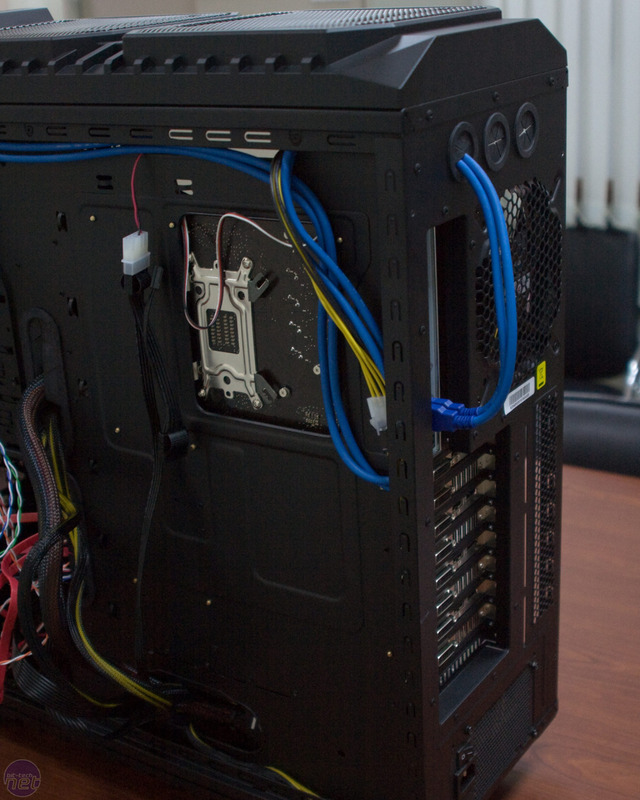 At the bottom of the case, Cooler Master places a removable cover for the power supply cables to keep things looking neat, and there are cable routing holes in the fixed motherboard tray to allow you to pop cables back in at strategic places. The HAF X gets a USB 3 upgrade too, but because no motherboard has onboard pin-outs yet, two standard sockets on the rear I/O will need to be fed via plugs to the front of the case. It's not pretty, but there's limited solutions to this problem available right now and the cables need to be of certainly quality (read: thickness) to work at the USB 3 spec. 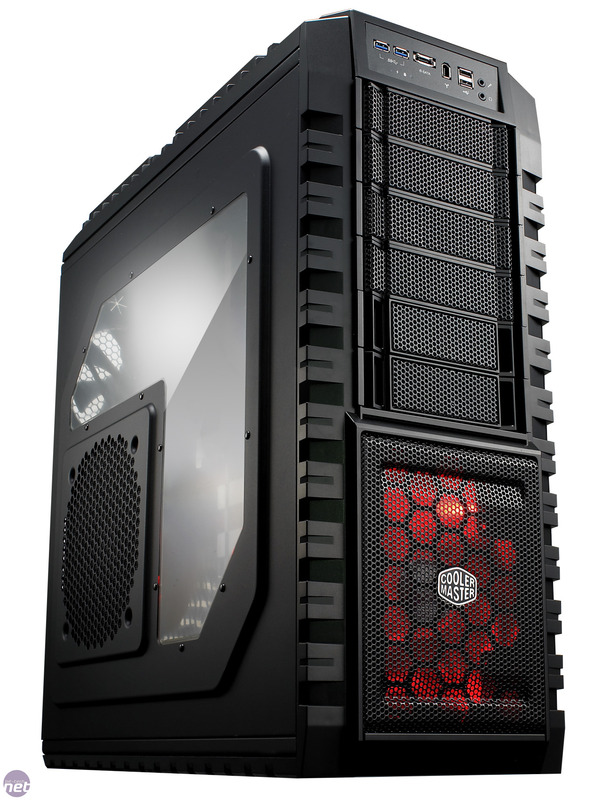 Visually, the HAF X has been designed in keeping with the previous 932/922 and it sports an industrial and ruggedised aesthetic, otherwise known as looking like Darth Vader's beer fridge. 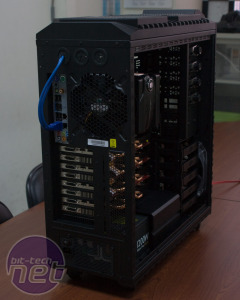 The front ports consist of the aforementioned pair of USB 3 ports, along with eSATA, Firewire, two regular USB 2 ports, plus 3.5mm headphone and microphone jacks. Above all these, the power, reset and LED buttons can be concealed by a sliding sliver of plastic to prevent an accidental press. That's a clever and simple feature in theory, but it's not exactly an elegant solution. The HAF X is aimed to retail at $199, about $60 more than the 932, so make your calculations to £s from there. Addendum 26th May 2010: We've just heard from Cooler Master that it has an MSRP of around £150.